This week MOTORESS unveiled the new for 2012 International Female Ride Day logo. I’ve had the chance to meet with Vicki Gray of MOTORESS on a number of occasions. We’ve walked through the aisles of the International Motorcycle Show in Toronto, and shared coffees and drinks, I’ve even written about the glamourous female motorcyclist. International Female Ride Day is a MOTORESS initiating campaign aimed at highlighting the female motorcyclist and encouraging other women to take up the sport. Here I stand. A man. With hairy legs, questionable hair style, and a healthy disregard for fashion. A man’s man. That doesn’t stop me from appreciating what the girls are doing, if anything, I encourage it! I’ve already expressed my appreciation for MOTORESS. We all stand to gain from a stronger female riding community. We need a thousand more MOTORESS’ out there, but there can only be one. Luckily, it seems like every other female motorcyclist I meet already follows MOTORESS. 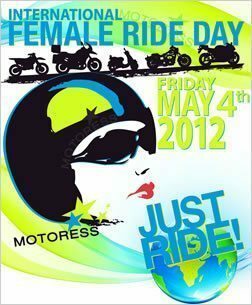 May 4th, 2012, marks the 6th annual International Female Ride Day. The event needs no registration and has no cost, simply hop on your trusty iron steed and go to town, cowgirl! Here’s the new 2012 logo, said to invoke neon motorcycle safety colors, with the always alert and always attractive IFRD motorista. Have a great ride ladies!